You’d think that by now we would have more than enough ways to share and talk about interesting things you find on the internet, what with Facebook and Twitter and Google+ and dozens of other services. But Josh Miller — founder of a discussion platform called Branch and a new service called Potluck — says it is still too hard to just talk with your friends about interesting things you find on the internet, not to mention meeting new people. In a nutshell, Miller says that he wants Potluck to be a social platform like Instagram, but for talking about links rather than photos or videos. Potluck launched Tuesday morning after spending some time in closed beta testing, and after reading Miller’s launch post about the new service, I decided to call him up and ask him to tell me more about why he built it, and what kind of need it fills that other services and networks don’t. Isn’t sharing links and discussing them with friends what Twitter is for, and the reason Google launched Google+? Can’t we already do that on Reddit and Facebook? Where does this leave Branch? I also called Miller because I wanted to know what the launch of Potluck means for Branch, a web-based forum for discussion that he launched last year with financial backing from Obvious Corp. (the company founded by former Twitter founders Evan Williams and Biz Stone, and early Twitter staffer Jason Goldman) as well as SV Angel and Betaworks. Miller said that while Branch continues to serve a purpose — allowing publishers to host invite-only discussions — it wasn’t meeting the need Potluck is aimed at, which is making it easier for small groups of friends to discuss things they’re interested in. One of the things that keeps some users from engaging with a lot of these networks, Miller said — including many of his twenty-something roommates and their relatives — is the fact that they are so public, and seem so oriented towards gaining massive amounts of followers or contacts, with everyone obsessing about how many favorites or retweets they have. Some internet-native users may enjoy that, he said, but others don’t, and they can be intimidated by the demands of those kinds of networks. 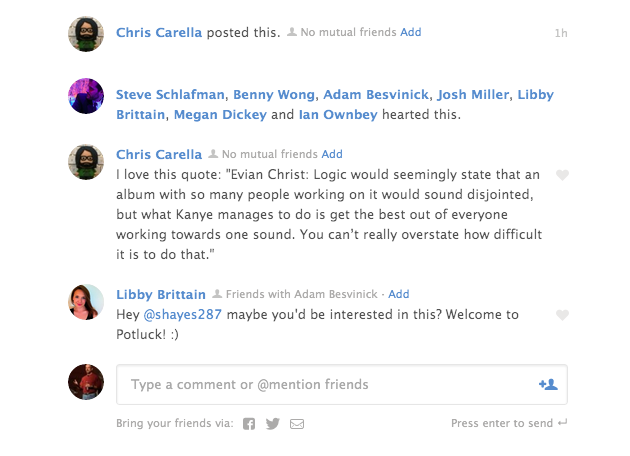 Although Potluck is public, it is designed to seem more like a dinner party with friends and their friends, the Branch co-founder says — and it deliberately doesn’t show the identity or avatar of the person who originally shares a link, so that all a user sees is the topic or the headline. After they click on the link, then they can see an excerpt in a separate pane, along with the identity of the person who shared it and anyone who clicked on a heart to “like” it. Although the focus in Potluck is on sharing of links, Miller says the real intent of the service is to get people to engage in conversation with their friends — and also to meet new people who they may share interests with, in a more non-threatening environment than Twitter or Reddit or some other internet forum — and the link is just an excuse to start that conversation. He said Potluck is an attempt to take older internet social networks like BBSes and newsgroups and email mailing lists and reinvent them for younger users who are more comfortable with Facebook and Instagram and Snapchat. 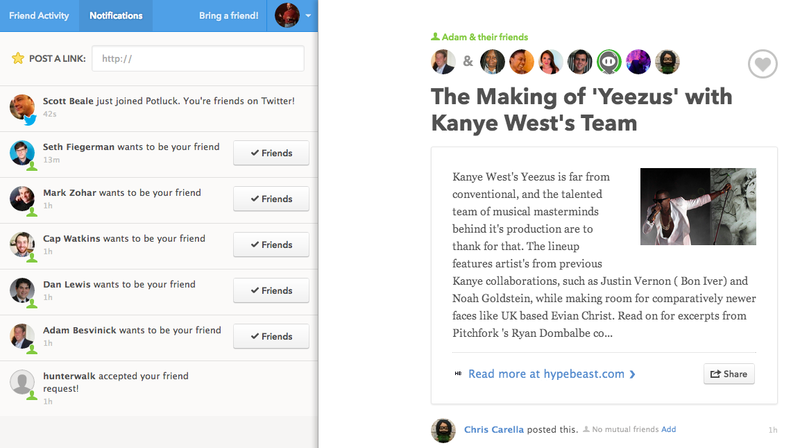 But do people really need another social network? One of the issues that I and some others had when Google+ launched was that it seemed like just another place where we had to post our links and try to engage with people, when we already had too many of those competing for our time. Miller said that this is definitely a risk that Potluck will have to overcome, but that he believes none of the existing solutions work for the kind of user he wants to appeal to — the one who finds interesting links, but doesn’t want to share them on Facebook because it’s too spammy, and isn’t on Twitter or doesn’t want to use it for that purpose. In some ways, Potluck feels like it is trying to find a spot between private sharing of links — the kind that happens over Gchat or email or in private groups on a variety of services, which Alexis Madrigal at the Atlantic and others have called “dark social” — and the kind of overly public sharing that occurs on Twitter and Facebook. But is there a large enough need for such a thing? One other interesting aspect of Potluck is that Miller says his team deliberately chose to use the Facebook-style “mutual friend” or symmetric follower model, rather than the Twitter-style asymmetric model (where someone can follow you without you having to follow them back), despite the fact that the consensus among many startups and venture capitalists is that the latter model allows for much faster growth and a broader appeal. Miller says that’s because he wants Potluck to build a strong network, not necessarily a large one. Only time can tell what more can potluck.it bring that we don’t already have from Facebook, Twitter or Google+. I think they are onto something, but haven’t quite scratched the itch yet. I’ve been working on something similar to Potluck. The one thing that’s a limiting factor to Branch, Potluck, Reddit, etc., is that they are made generally for a tech crowd. Those platforms won’t branch out to a wide audience because they’re not sticky enough. Instagram is sticky. So is snapchat. But once you start to make things complicated and incorporate too many rules, ‘normals’ will lose interest. As someone who likes to think that I am a writer, this may be an interesting an engaging forum to talk to people and learn about the world in a different way.